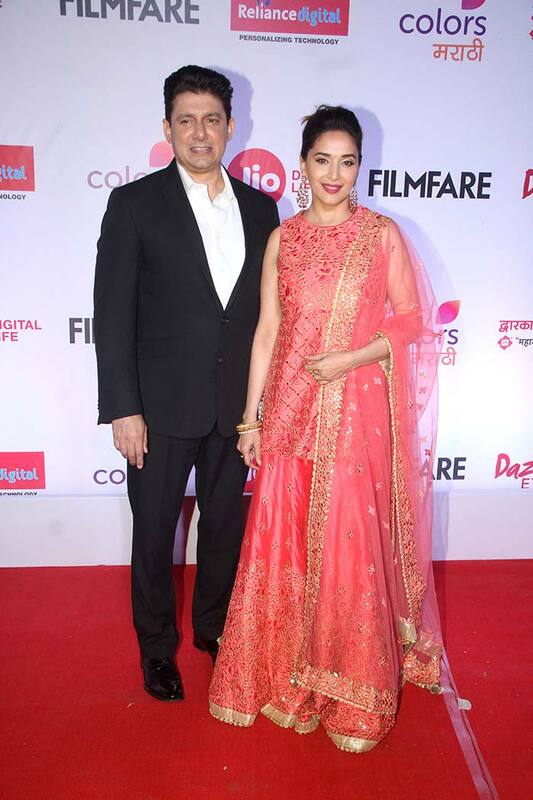 Actress Deepika Padukone, who is all set to feature in Sanjay Leela Bhansali's much-awaited film Padmavati, was spotted at the Jio Filmfare Marathi Awards in Mumbai on Friday. The 31-year-old actress looked absolutely stunning in a Sabyasachi sari, which was embellished with floral work. Deepika kept her make up subtle and accessorised her look with pink jhumkis. 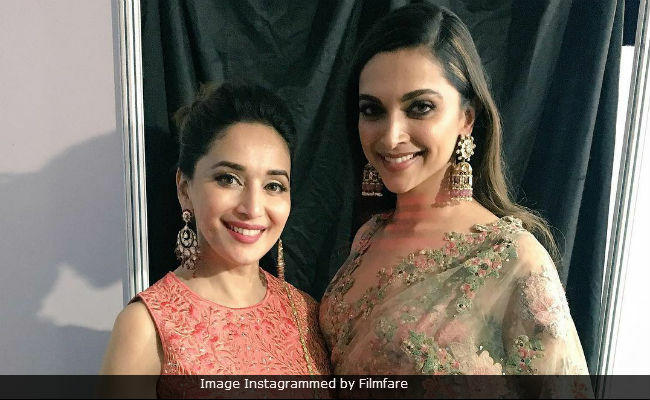 What made the fans happy was Deepika being clicked with the gorgeous actress Madhuri Dixit, who also walked the red carpet of the Filmare Awards. The Devdas actress was beautiful in a pink suit and her smile won our heart. Madhuri was accompanied by her husband Sriram Madhav Nene. The fans would love to see the duo on the screen together sometime soon while Deepika once featured in TV reality dance show Jhalak Dikhhla Jaa , when Madhuri Dixit was one of the judges of the show. It's been a while since we saw Madhuri on screens, the actress with a 1,000 watt smile. But she is all set for her debut in Marathi Cinema. Yes, Madhuri will soon feature in a Marathi film. The yet-untitled film, is said to be a slice of life story which revolves around the self-realisation journey of a woman (played by Madhuri) but will come sprinkled with a dash of humour attached to its narrative. "It is a story of every household yet, it has a silver lining. It not only gives you hope and inspiration but also encourages you to live life in the true sense. The most fascinating factor for me to choose it is that it is going to carve a niche in everyone's heart," Madhuri Dixit, 50, told NDTV. Meanwhile, Deepika Padukone, is in high spirit for her upcoming film Padmavati. The film is based on the folk tale of rani Padmini of Chittor, who performed jauhar with several Rajput women when Alauddin Khilji (played by Ranveer Singh in film) invaded the fort of Chittor. Actor Shahid Kapoor plays Deepika's onscreen husband in the film, which is slated for December 1 release.